How do I set up a Questionnaire? To create your Questionnaire, navigate to the Questionnaires tab on your Project Details page and click the Create button. You will then be met with an empty Questionnaire. To modify its name and description, simply click Edit Questionnaire. An edit window will open up, where you can name the Questionnaire and add a description, as well as any additional instructions for your Vendors. NOTE: Every single Questionnaire is auto-designated a unique reference number. Bonfire uses this identifier to verify that the vendor is uploading the correct template into the correct slot, so that your evaluators can use the side-by-side response view. Therefore the unique reference number changes even if you have more than one Questionnaire where the questions and contents are the exact same. Once you've named your Questionnaire, you can move on to adding your questions! NOTE: If you are bulk importing your questions from an Excel spreadsheet, you can disregard the rest of this page and go to our Bulk Importing Questionnaires page for further instructions. If you plan on adding questions individually, you will need to create your Question Sets beforehand. You can create them as you add items, or you can create them all at once before adding items. To add a set, click on Add Question Set in the bottom-right corner of the page, and the Add Question Set window will open. From here you can name the set, order it, and add any Vendor instructions. 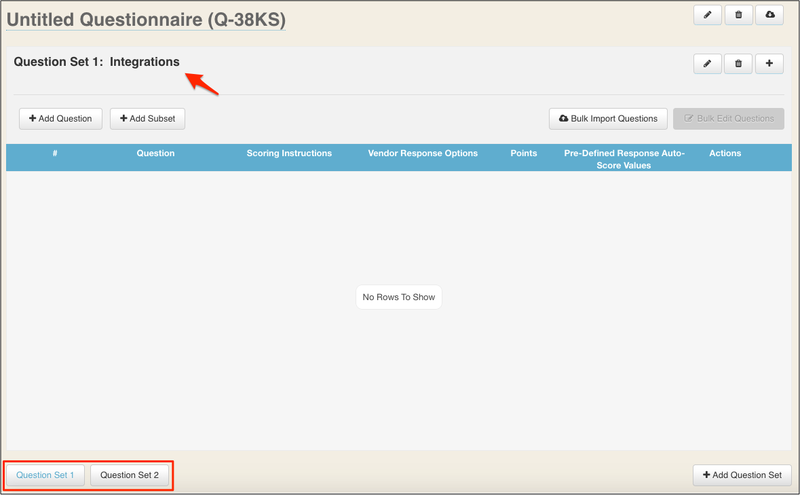 When you add Question Sets, they will show up as separate tabs along the bottom of the Questionnaire. Now you can click into any of these sets, and add questions or subsets into them. To add a question, click the Add Question button. A window will open where you can input your Question Set title and choose your question Subset, should you wish to organize it that way. You can then set the amount of points you'd like to allocate to this question. Or, alternatively, you can set the question as Info-Only which negates adding points. Here, you can also check off if you require Reviewers to add a Scoring Comment. 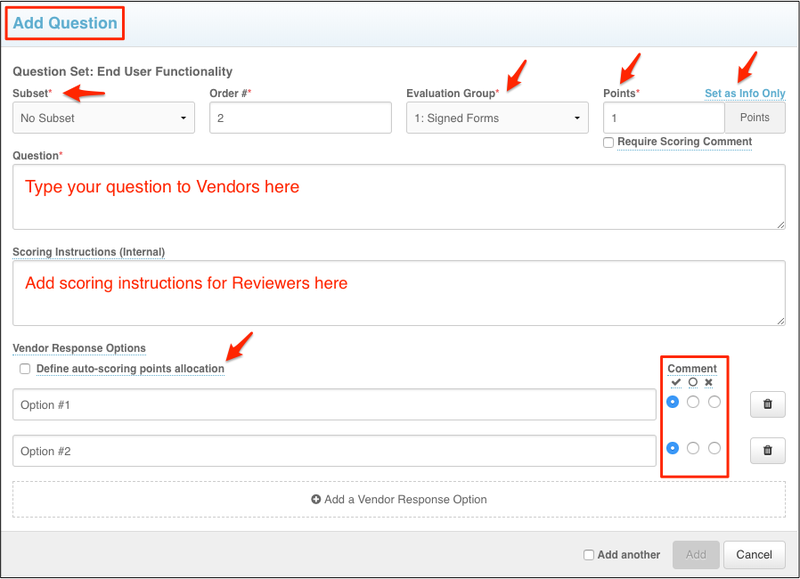 Vendor Response Options and Auto-Scoring of Vendor Response Options can be inputted when creating each Question. Questions can be set as Info-Only on an individual basis as well. Once all of your Questions have been added, you must map it to a Requested Information slot in order to request it from your Vendors. See our How do I make a Questionnaire available to my vendors? page for more instructions on how to do this. You may also want to set up some Criteria so that your Evaluators know they have to score it. For instructions on that, see our How do I map my Questionnaire to Criteria? page.